As appeared recently on eBay, these little guys look like they could have been toys in a fast food meal. I gotta say those helmets look really uncomfortable. More scooter wine! Our cups runneth over. Terre De Trinci is a winery located in the Umbria region in the center of Italy. And their wines have been rated 90+ points in Wine Spectator so you know their boxed wines are probably going to be pretty good. If you hail from Arizona, you’re in luck as both of these wines are available at the Bashas supermarket chain. If they are spotted elsewhere, would ya let us know? Wine review of Terre De Trinci’s Chardonnay and Sangiovese box wines. Find a Bashas store near you. Thanks to Monica S. for this find! It’s okay to embellish . 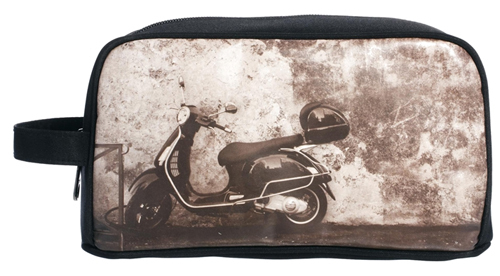 . .
Modern Vespa owners get some scrapbook love with these green Vespas with silver foil accents. 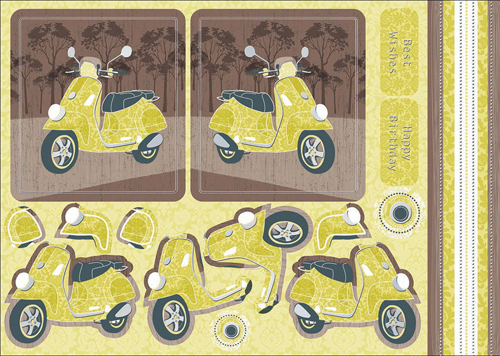 You get one 12″ x 8-1/4″ sheet of die-cut scooter punch-outs and another sheet of patterned cardstock. 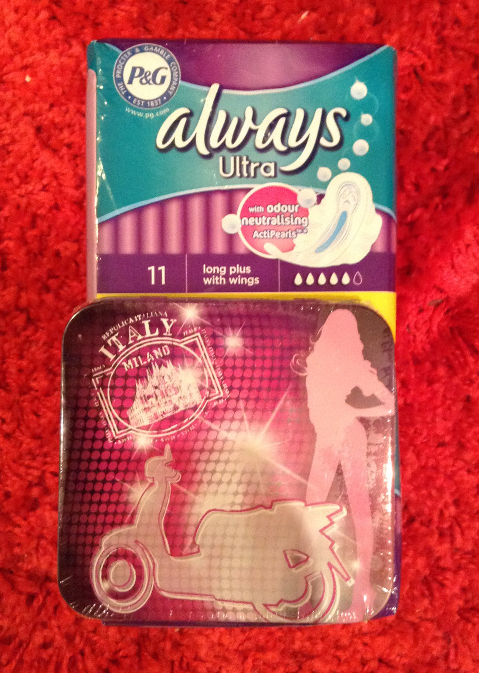 These are from the “KANBAN – All About Him Collection” and are just $3.40 a set. 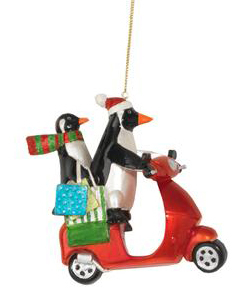 Like cats on scooters, penguins on scooters seem to be a common theme and we’ve featured quite a few of them in the past. 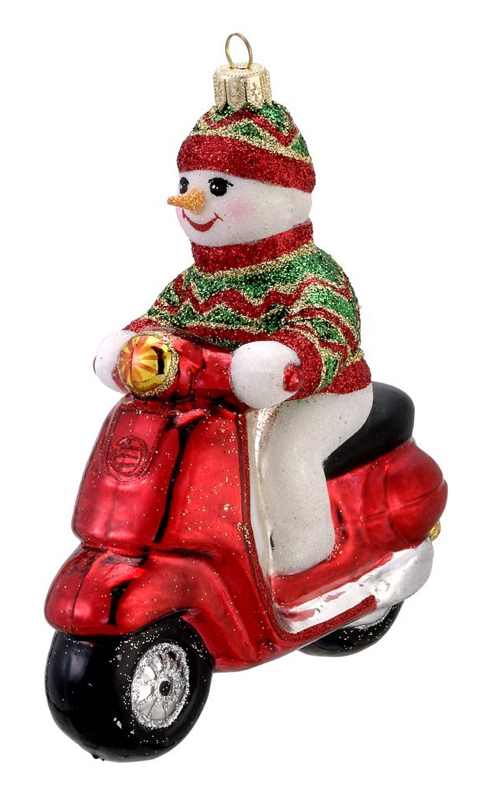 Here are two more riding a modern Vespa. They’re resin and measure 4″ x 3″. The price is $11.99. Reindeer shouldn’t have all the fun. Here we have a different kind of snow bird. 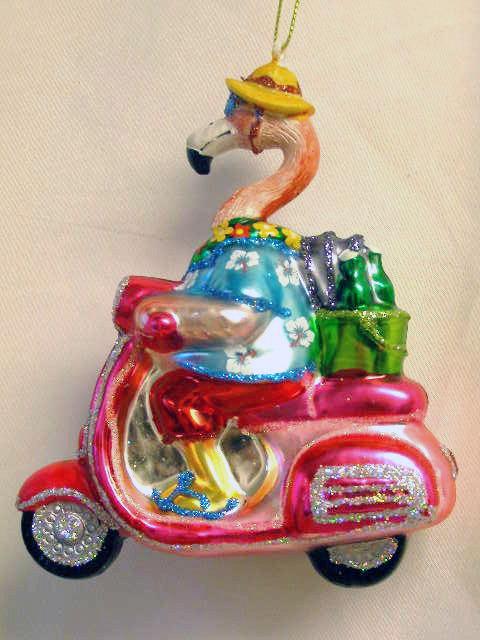 And this Flamingo is outrageously decked out bearing presents on the back of his Vespa. Check out the sparkly blue flip flops! He’s $13.99. R Nichols is a stationery and gift accessories shop based out of Florida. The “Pisa” design is featured on a luggage tag for $6 and on notecards (3.5 x 4.78″) in a pack of 8 for $16 or if you’d like to have them personalized, $18. The lower design in green is available on gift cards (2 x 3″) in a pack of 10 for $5.